I am super excited to see this. This is the first time seeing it. I love going into films that I have not seen, and this is one of those that I have always wanted to see, but for some reason never got around to viewing it. Now thankfully I get to watch, and review, and own it on a lovely Special Edition Blu-ray from Twilight Time. What better way to experience it? 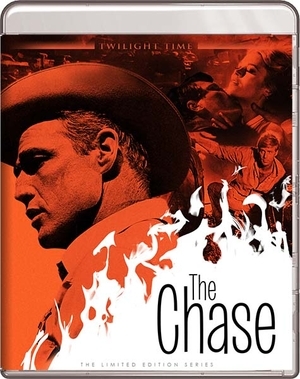 Twilight Time always creates wonderful outlets to important older films, and The Chase is another prime example of that. The plot to the film is about a prison break. One of your main players is Charlie “Bubber” Reeves who escapes. He is in jail accused of murder. Now the escape causes Bubber’s hometown to be an uproar. Introduce Sheriff Calder who believes Bubber might be innocent of the crime that he is in jail for. Calder believes that Bubber will return to his hometown because Bubber’s wife Anna. Bubber escapes with another fugitive who ends up stealing and killing while out, making it worse. Soon Bubber leaves on his own. So begins the hunt, the truth, and the overall crime drama comes together in a unique thriller that stands out even to this day. Directed by Arthur Penn. Penn was a unique director in that he directed both small and large cinema. From TV to feature film. He always maintained his characters that he filmed in believable fashion. Started directing 1953, and did so until 2001. He sadly passed away in 2010, but left an amazing array of cinema. He is known for many wonderful masterpieces of cinema such as the one and only 1962’s, The Miracle Worker which was nominated for 5 Academy Awards, which it won 2, for Best Actress and Best Supporting Actress. Arthur Penn was nominated for best director, which I think he should have won. He also directed the one and only 1967’s masterpiece, Bonnie and Clyde nominated for 10 Academy Awards. It won 2. Arthur Penn yet again was nominated for best director, but did not win it. He also directed the amazing, and very underrated 1975’s Night Moves. Penn also directed the underrated 1981’s Four Friends. Penn had a wonderful career of films such as 70’s Little Big Man, 76’s The Missouri Breaks, 85’s Target, 87’s underrated Dead of Winter. A great director, and a great career. A director that sadly never won an Academy Award for best director, which I feel is a true shame, nominated 3 times for Best Director. 3 films Alice’s Restaurant, Bonnie and Clyde, and The Miracle Worker should have garnered him at least one award. He directed many wonderful films that showcase his ultimate brilliance and The Chase is one of them. The stars the flawless Marlon Brando. Brando always gives amazing performances in cinema. He has been honored with another Twilight Time Blu-ray Special Edition release with, The Young Lions, which you can read my review for HERE. His character’s that he plays are prime examples of building character’s in cinema, to be remembered. Brando always executes his characters with mastery, and his dynamic art of creating flawless characterizations of fictional individuals, simply put, bringing them to life as believable in many of his roles, is what makes his mastery stand out. This also has the amazing Jane Fonda. She starred in one of the great mystery thrillers of all time 1971’s Klute, which might I add won her an Oscar. She is an amazing actress that starred in many wonderful films. Also starred in some amazing drama’s in her career, the one and only 1977’s Julia, which was also released as a Twilight Time Special Edition Blu-ray, which you can read my review for HERE. She also starred in the amazing 1979’s The China Syndrome. But it is the tear jerking, my all-time favorite, 1981’s On Golden Pond where she starred with her father, the masterpiece performer Henry Fonda that will always stand out to me. Many of her performances have been captured on Twilight Time Blu-ray Special Edition’s, such as 9 to 5 which you can read my review HERE , and also Cat Ballou which you can read HERE . Also starring the amazing Robert Redford. I've always been a huge fan of Robert Redford. He has such a talented way of directing, acting and most of all paying homage to all the wonderful independent elements of filmmaking. He started the Sundance film Festival, sadly, The Sundance today, tends to not be what it, was supposed to be. The Sundance film Festival and the Sundance Channel has totally changed its original premise. It use to display independent films, true independent films, and true, I state, true independent directors, the ability to accomplish many things. There are a few that still tend to get through, but the majority of Hollywood has destroyed Sundance, it's nothing like I remember growing up. Redford has been in so many wonderful films. Many cinematic films that should always be remembered and respected. He is still acting strong today, and no matter what, Redford is a brilliant performer, both in front of the camera, and behind the camera. The Chase is a great thriller of the past that feels often at times very underrated when it comes to cinema history. Flawlessly directed, acted and an overall complete award worthy film. Amazing performances. Amazing cinematography. Wonderful music score. I am super happy that Twilight Time choose this film for one of their special edition Blu-ray's. The transfer is amazing. The high definition is colorful, vibrant and beautiful. The audio is wonderful and crisp. The audio and video are great examples of how to bring out cinema to new generations or older generations to experience. Twilight Time did a fantastic job. Isolated Score Track: This was a fantastic listen by itself for the fact of who is behind it, John Barry Pendergast. A master talented composer, conductor and musician of film. He has worked and created some of the greatest film scores such as the brilliant masterpiece Midnight Cowboy, Dances with Wolves, and might I add was the original person to arrange and perform the iconic James Bond theme, on the very first James Bond film, Dr. No. He through the span of his life won many awards, but also most importantly won 5 Academy Awards for his excellence in film scores. Of those five two of those Oscars where for Born Free which has also been released as a Special Edition Blu-ray, which you can read my review for HERE. He brings the music behind the films into a beauty of their own. Twilight Time did an amazing job honoring this master on this special feature. Audio Commentary with Film Historians Lem Dobbs, Julie Kirgo, and Nick Redman. A wonderful listen. Huge fan of these film historians. I love all threes knowledge. Listening to good film historians is always a plus, and Twilight Time uses a great selection of important film historians on many of their releases. Another wonderful experience from Twilight Time. An amazing transfer. Wonderful audio and video. The Chase is a great film to remember. Wonderful acting. Amazing directing. A high quality Blu-ray. Twilight Time choose a great film for another important release on Blu-ray. They pay such attention to their products, and that is way I often praise and recommend there releases, and The Chase is no different, for I recommend for any lover of great films and collectors of top quality Blu-ray's, this is a must..